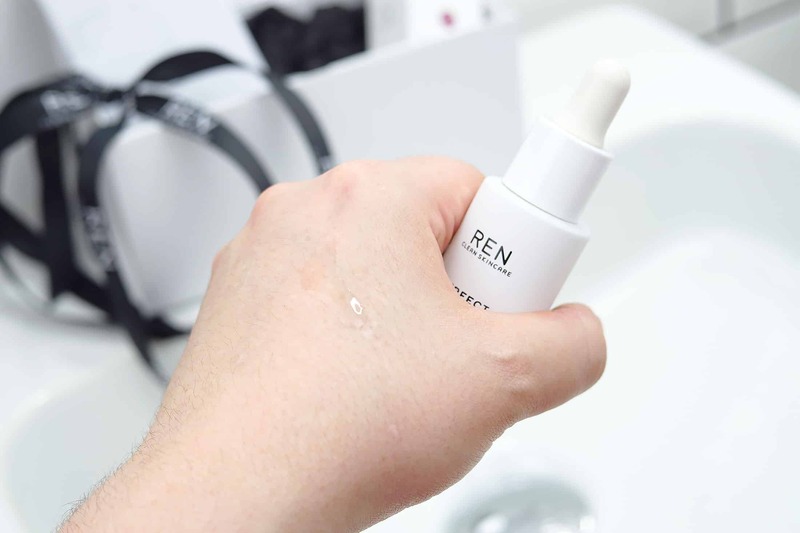 For a serum, Ren’s Perfect Canvas Skin Enhancing Priming Serum is pretty light on the ingredients, with only 18 overall. What it does mean though is that there isn’t a load of unnecessary garbage swilling around in there; it’s pretty much all good stuff. It does contain Sodium Benzoate as a naturally derived preservative. There is a lot of fear-mongering and unsubstantiated hype from the ‘I want to live chemical-free’ brigade over this ingredient but give this a read if you’re bothered and want something solid. Instead of silicons, the product uses natural sugars from Agave, malt-sugar and Alpha-Glucan Oligosaccharide leave the gently mattified finish whilst a lactic probiotic is used to smooth out the skin (Lactococcus Ferment Lysate). Hyaluronic, Citric and Lactic acid then get to work by hydrating skin and helping slough off dead skin cells through the day. The serum has a texture of slightly thicker water and so sinks in extremely quickly. When you put it between your fingers, it does foam ever so slightly which I think is to do with the sugar-based formulation but this does disappear once applied to the skin. Also just in case you were thinking the sugars would make it sticky, it doesn’t; sugars works very differently when properly formulated in cosmetics. I definitely like the feeling of this; it’s quick and easy with no fuss. After a few days use, my skin was definitely softer and brighter and is being used in underneath Charlotte Tilbury’s Magic Cream. This is a big difference from The Body Shop Tea Tree Serum that I use normally to defend against outbreaks, so I’ll see how I go; often the lack of ‘latest technology’ in that is offset by its unmatched ability to stop and/or kill spots. All-in-all, this is a winner. It’s simple yet very effective as a serum with some of my favourite smoothing and hydrating ingredients; but also a great primer for anyone wanting to put-off that midday shine for a few hours longer. Ren Perfect Canvas Skin Enhancing Priming Serum is £50 for 30ml. This article first appeared on MANFACE written by Thom Watson. It was published on Wednesday 18th October 2017 and was last updated on Wednesday 18th October 2017 at 10:14pm. It's categorised under Combination Skin, Dry / Dehydrated Skin, REN, Serums & Treatments where you'll find more related content.